Family recipes are my favorite and the other day it was so cold and dreary outside and the only thing that sounded good was chili. I'm obviously biased, but my mom's chili is so great. Growing up, she always make tons of it, so we'd eat it for a couple days in the dead of winter. Okay, so I grew up in Arizona and there's no such thing as winter, but still, chili is great anytime, anywhere. I had to modify it a tiny bit to make it paleo-friendly, but it was still just as good. Do you have any amazing family recipes? Add ground beef, onion and green peppers to a large pot and cook until meat is brown and onion is tender. Stir in remaining ingredients (except for kidney beans, cheese and sour cream). Reduce heat; cover and simmer for 2 hours. For all you non-paleo eaters, top with sour cream and lots of cheese! Meat, onions & green peppers. Once cooked, add in all the other good stuff. hint, its even better the second day! 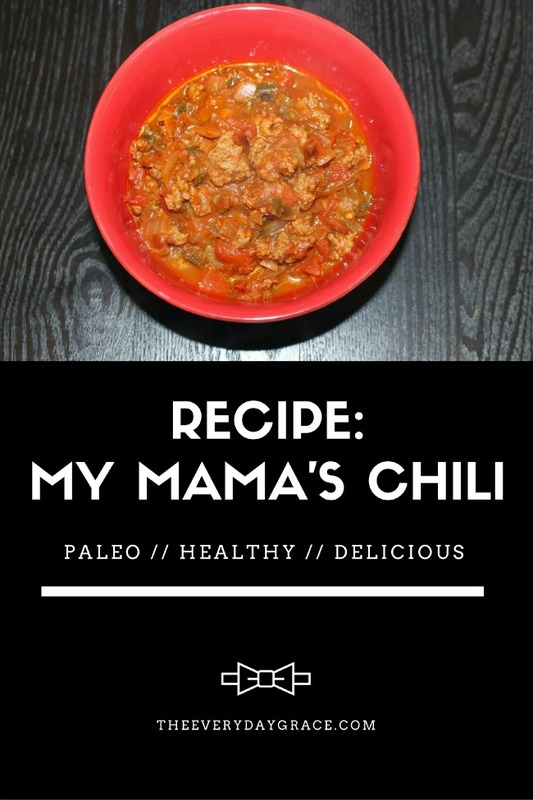 Ohhhh this chili recipe looks so delicious! Chili is one of my all time fav dishes, especially this time of the year. Thank you for sharing your great recipe!